Let’s get started by asking the most important question first–what’s the goal of your social media advertising strategy? Going blindly into paid social will only cost you time and money. But nobody is saying you have to be an expert advertiser to see results. Instead, it’s all about prioritizing your goals and choosing the best one to attack first. Every brand has a different goal. 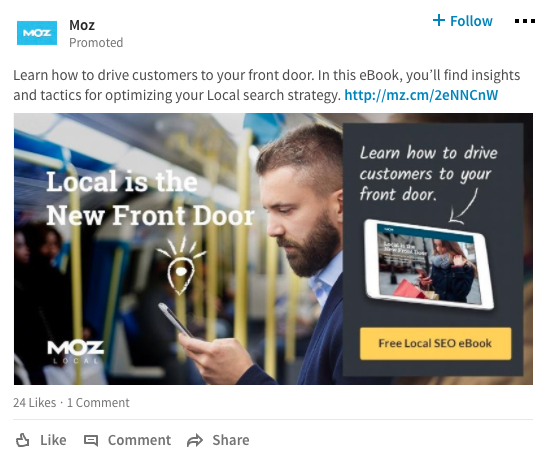 And even though Moz uses LinkedIn ads to promote its ebook and community outreach, your business probably has its own unique objectives. Increase Traffic: If you need more eyes on your homepage, blog or product landing pages, traffic helps. Traffic goals boost your total unique visitors and pageviews. This goal is perfect if you’re looking to promote a new site, brand, product or sale/deal. Increase Lead Generation: Many brands use paid social ads to help generate leads. This is ideal for brands wanting to promote gated content or other resources that can help users become more invested in your brand. This can be a multi-step campaign as you could target these invested users specifically on the next ad. It also helps bring prospects into your funnel. By now, you should have decided on a clear cut advertising goal–the next decision? 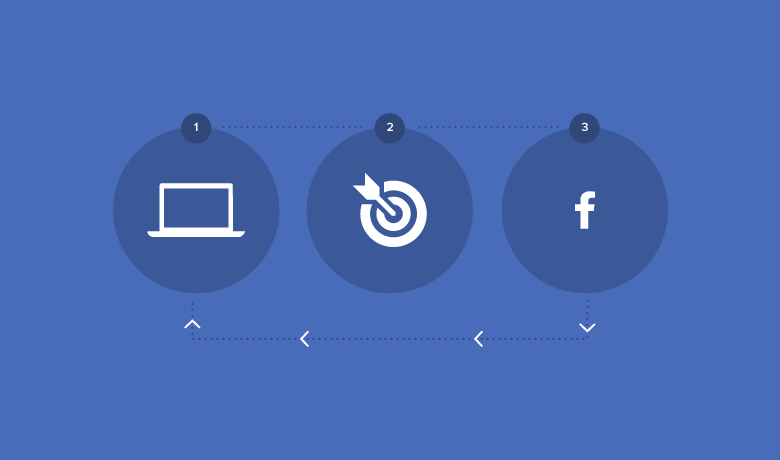 It’s time to pick and choose which social media platforms you’ll use for your ad campaigns. Is this channel performing well organically for me? Does this channel’s demographics match my brand? Do our competitors target users on this network? Does my target audience consistently engage here? Does my ad format (multi-photo, video, GIF, etc.) fit the platform? 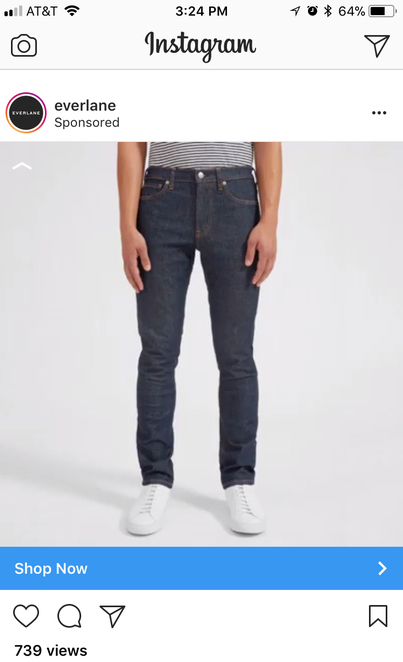 For example, Everlane has a good paid social presence on Instagram. The brand uses highly-visual content to get people to click and shop. It’s all about knowing where your target audience lives and where they’re most accessible. Again, each network has its own benefits to paid advertising. But you do not need to use every platform. For starters, try choosing one or two networks that best align with your goals and objectives. Snapchat: This B2C platform works best with for pure engagement metrics, especially for younger audiences. Its sponsored filters and lenses are built to get users to engage, have fun and promote the product. Visibility and awareness are high markers for Snapchat ads. Pinterest: The ads on Pinterest are often used to generate immediate sales of your product or services. Your paid content blends with other pins, allowing your brand to work as another avenue for your web store. Targeting an audience for social media ads is not an easy task. Trust us–we’ve spent hours working on Facebook Ads Manager, trying to select our target audience and share the best content. Trying to do this while matching your brand voice, while seeming appealing to completely new users who’ve never heard of you is tough work. Whether you’re a pro at social ads or just getting started, one thing remains the same–you have to find a middle ground with your targeting. Ad platforms are only getting more complex and sophisticated, so it’s important to spend your time wisely by creating workable target audiences. For starters, Facebook works as a great introductory space to work on your core audience. Use targeting features such as Interest Targeting to build your custom audience. This allows you target solely on interests and things that users like and share on their own Timeline. Additionally, you can use the Audience Behaviors feature to narrow down users who have specific intents like purchasing behaviors or traveling intentions. All these things lead to sales and with the right behaviors selected, you’ll see those who are active with brands that relate to you. Lastly, it’s necessary to know your core demographics when you target specific users. And to that point, you should know the demographics of your network to understand how audiences will react to your ads. 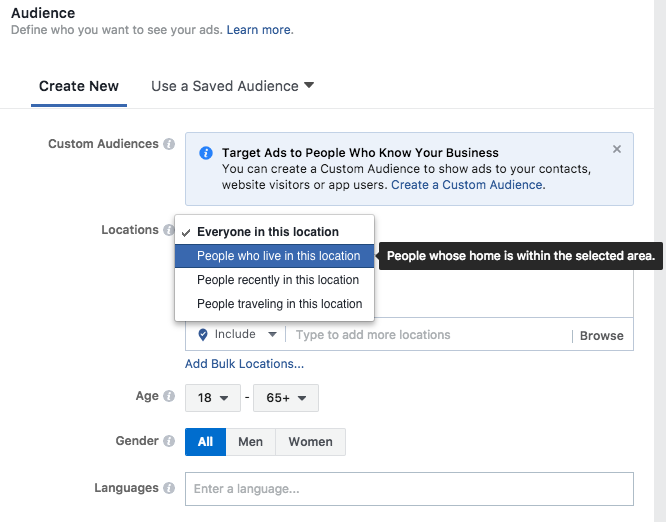 On Facebook you have the ability to save and alter your audience targeting settings with ease. The same is true on LinkedIn and Twitter. Once you start to find the middle ground between users’ interests, behaviors and demographics, save these audiences. You’ll always have the chance to come back and make changes to your segmentation. However, it’s best to avoid overly obsessing on your audience targeting as you’ll most likely make edits afterward anyway. 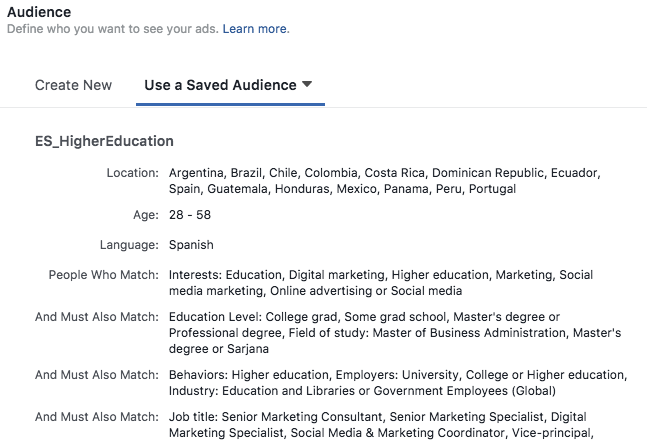 For example, if your ad needs to target Spanish marketers who are involved in higher education, you’d want to save this audience first. After testing, then you can make tweaks to each subcategory to fine tune your audience. Let’s be real–if you’re needing help with social media advertising, you’re not likely going to nail down your audience in one try. That’s OK! Building an audience is a test-and-go process. Just be ready to learn and make changes as you build out better target audiences. You’ve chosen your ad goals, the networks to promote and built an audience–now what? It’s time to choose what type of content you want to advertise! Before we get started, realize there’s several different types of paid advertising you can choose from on social media. Not every type of ad will work for your brand. However, one of the best techniques to follow when creating paid content is to seamlessly blend into feeds, walls and timelines. A great example of this is with TD Ameritrade promoted ads on Twitter. This ad seems harmless enough–right? But between a feed where a user would see various content updates with similar stock photos, this ad blends right in with other Tweets. Your ads don’t have to always make people stop and take immediate action. Instead, you can use ads on social to blend in and feel like organic content to users. According to our Q3 2016 Index, 46% of users will unfollow brands posting promotional messages too frequently. For the most part, people know when they see an ad, which is why you want to avoid seeming too spammy. Lenovo uses Facebook video ads to promote new products. 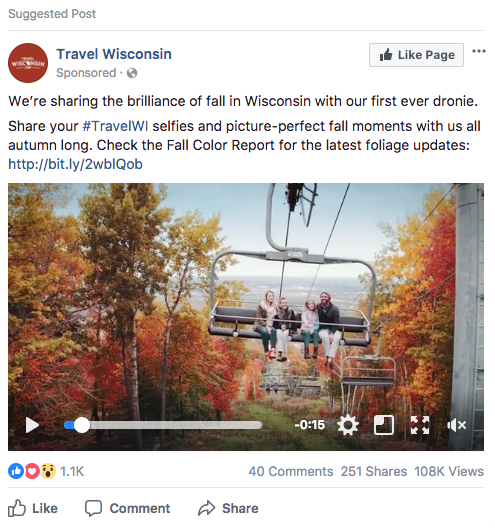 However, the video meshes well with other Facebook content and doesn’t appear flashy until you’re already engaged with the ad. From the examples above, there’s certainly differences in each format. This is why it’s necessary to learn the various ad formats so you can fit in well with organic content on the network. For example, if you only used text ads on Instagram, the “pop” or “wow factor” would be much less than a video or brightly colored image. With Instagram’s feed taking up the significant majority of the mobile screens, you have more opportunity to drive engagement with eye-catching ads. However, that same sentiment doesn’t really fit the style of a Twitter advertising or LinkedIn ad. 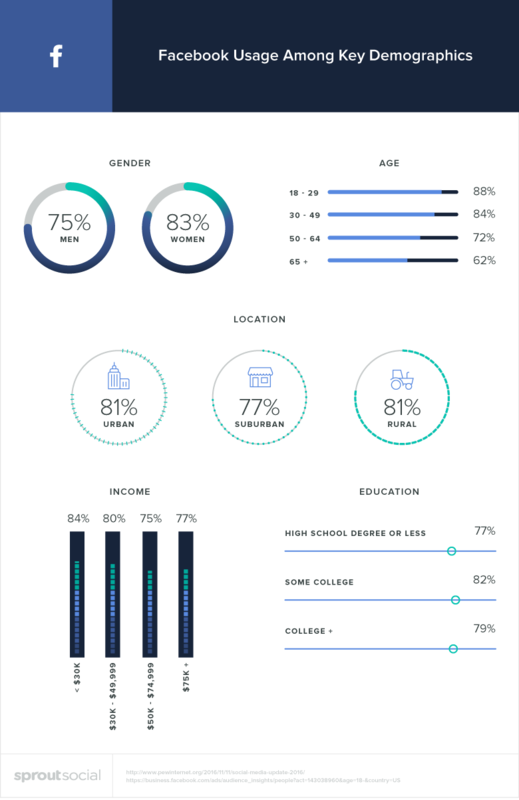 Currently, there are at least six variations of Facebook video ads brands use on the platform. Take the time to understand the pros and cons of each format before you decide to post. Awareness: Your first goal is to attract various users whether they don’t know your brand or those who are highly interested. This broad cast helps bring in multiple users of various backgrounds and age ranges. Consideration: This phase helps provide more relevancy to the individual user’s behaviors. Are they a former customer? A potential sale? New to your brand completely? You need to retarget each group differently to avoid being to spammy or repetitive with your ads. Transaction: The most cautious step is transaction because you only want to provide ads that give one last push. Once converted, avoid targeting to this specific audience with sales-driven content. To effectively move users this way through your funnel, you have to create the right steps in each area of your social ads. Additionally, your potential customers should arrive to specific landing pages that speak to them in their area of the funnel. Again, you can’t have introductory product launch ads sent to users at the tail end of the funnel. Instead, you would want to cater content specifically toward their level of the funnel. It’s beyond necessary to be mobile-friendly with your social ad funnel. In fact, the Pew Research Center found 80% of time spent on social media comes from mobile accounts. That means your funnel has to have an easy connection from ad to landing page to transaction. 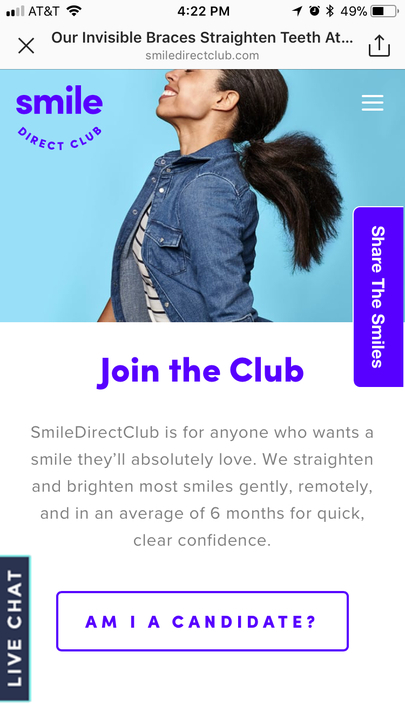 Smile Direct Club uses mobile through Instagram advertising to educate and inform potential clients about its brand. The simple landing page allows users to share content with its brand, live chat or find out if they’re qualified for the product. The funnel is perfectly created for various users arriving from the ad to a specific landing page. All of this is done with a mobile-friendly approach to keep users engaged with the ad from the native platform. You’ve put so much effort into your social media advertising strategy this far–why risk wasting your work with a poor bidding strategy? Once it’s time to start bidding for your ads, it’s far too easy to overpay or severely limit your audience with low bids. Instead, you have to find the right balance and optimize your social bidding strategy to be competitive, but money conscious. For starters, your bids go against a large amount of competitors trying to reach the same users. To make it possible for all advertisers to have a chance, there’s a bidding structure. But as you likely know, it can get expensive in a hurry. Keep your bids to a minimum to start and understand your campaign might not get enough views for the limited bids. However, this doesn’t mean you should avoid bidding higher amounts. In the end, networks like Facebook (and Instagram) work on a basis where everyone can get a share of the action–depending on how much someone pays. If you pay at the bottom range of your competitors, you’re going to see the fewest impressions. But sticking in the middle will let you see mid-range impressions versus paying the most to see the highest number of engagements. Not everyone’s bidding strategy will work the same for others, which is why this subject is so difficult for advertisers. But we have one strategy we’d like to share with you that could help you understand that math behind optimal bidding. In that case, your Cost Per Acquisition is still equal to: Clicks times average CPC divided by Clicks times Conversation Rate. However, you can simply remove clicks from the equation since they rule one another out. Then you find the CPA to equal: Average CPC divided by conversion rate. Don’t let me lose you just yet! Let’s say your max CPA is $20. You would try to find out the max CPC you need to bid to achieve your CPA. Therefore, you would multiply your CPA of $20 by your historical conversion rate to get your max CPC. In our case, our max CPA is $20 and conversion rate above was only 1%, so you have the equation: $20 x 1% = $0.20 CPC. This bidding strategy allows you to be smarter about spending by using common historical data. More likely than not, you already know one or two of these figures, which will help you discover the third factor. Again, this won’t work for everybody, but it’s a safe and smart bidding strategy to work with your own goals and budget. For any ad campaign cycle, it’s essential to continuously refresh, alter and test your content to get the most out of it. One of the worst things an ad manager can do is let your various social ads get stale and overused. Check ad copy: Always see what your words, phrases and calls to action are doing for your audience. Be confident in your copy and ensure it’s the best text that could go with your campaigns. Change the creative: Do you use photos or illustrations for your ad image? Have you tested both variations to see what your audience responds to the most? The simplest design changes could mean the difference. Update the landing page: Lastly, you should check your landing page to ensure your ads are successfully pushed through the funnel. There’s always a chance you could bottleneck your funnel with an insufficient landing page from your ads. The last step in your social media advertising strategy is to hone in on what you do best. Learn your own best practices and always test to make future campaigns easier. Many advertisers work with design, content, development and social media teams to launch ads. As you learn your own best practices through constant testing, you’ll work faster with your teams and be more confident going into the next campaign. We’ll say it a million times, but everyone’s strategy will be different. It’s up to you how well and thorough you plan your campaigns to see true success.